ACP - Memory Upgrades 2GB DDR3-1333MHZ 204-Pin SODIMM HP Nbook [AT912UT-AA] - $22.52 : Dealpops.com, Good deals are keep popping up! 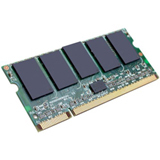 "Manufacturer: ACP - Memory Upgrades Manufacturer Part Number: AT912UT-AA Manufacturer Website Address: www.addoncomputer.com Brand Name: ACP - Memory Upgrades Product Name: 2GB DDR3-1333MHZ 204-Pin SODIMM for HP Notebooks Marketing Information: Add-On Computer Peripherals (ACP) has been the exclusive supplier to Ingram Micro's Memory Upgrades program since 1999. All ACP memory is built to JEDEC Standards, to meet or exceed the Tier 1 OEM's factory requirements. All our memory comes with a Lifetime warranty, and is 100% guaranteed compatible for the systems it is intended for. (Actual part shipped: AA1333D3S9/2G). Product Type: RAM Module Memory Size: 2 GB Memory Technology: DDR3 SDRAM Number of Modules: 1 x 2 GB Memory Speed: 1333 MHz Form Factor: 204-pin SoDIMM Dimensions: 0.16"" Thickness x 1.26"" Width x 2.68"" Length Weight (Approximate): 0.71 oz"